Derold Ernest Sligh - "Heaven's Door" and "Air Drills"
In his “Sermon on the Mount,” Jesus is quoted as saying: “Blessed are the poor in spirit, for theirs is the kingdom of heaven.” This means heaven is not for those who feel “rich” or righteous or deserving. It is for the spiritually poor. This picture was taken in a little village in the southern part of South Korea in Gyeongsan Province. 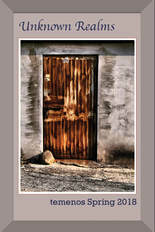 In the photograph, we see a humble door—rusted, a rock placed in front to serve as a lock; a low archway which would require the average person to bow in order to enter. I often return to this picture to be reminded to strive to be humble. Heaven is not a place for the self-righteous; it is a place for the “poor.” With that said, I couldn’t imagine the “pearly gates” being the entrance to heaven. I pictured a humble entrance. This door embodies that humble entrance. From this picture, I am reminded always to try my best to be poor. Much of the poetry I was inspired to write during my time in South Korea starts with a walk. If not through the busy streets of Seoul then it was a walk through the countryside, through the rice paddies or along a river bank or exploring a tiny village that sits under a mountain all in hopes of becoming more intimate with this place. For the majority of those living in South Korea, one hardly ever gives a second thought about “the tensions between North and South Korea.” Instead of looking at the North as a threat, many look at them more like an annoying little brother who likes to tag along and who will act out in order to get your attention. And living here, we simply live out our lives no longer noticing the war drills and the proliferation of foreign soldiers and the fear-mongering tactics used by the Western media lest we get caught up, also, in the fear. If we pay too much attention to it, we might even become afraid of ourselves. Derold Ernest Sligh currently lives in South Korea. He was born and raised in Saginaw, Michigan. He received an MA from Central Michigan University and an MFA from San Diego State University. He was the recipient of the J.L. Carroll Arnett Creative Writing Award. He was a guest poet at the Theodore Roethke Memorial where he ran a workshop for African American fathers and sons. His work has appeared in American Poetry Journal, Mythium, Konundrum Engine, Saw Palm, among other journals.